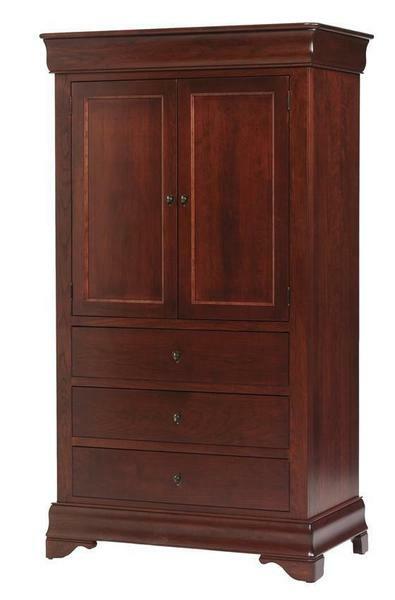 Featuring three fully-extending large drawers with smooth-motion, soft close drawer slides, the Amish Louis Philippe Armoire is sure to provide you with that extra storage you've been looking for. Make this piece work for you by adding the optional clothes rod and aromatic cedar drawer bottoms for the perfect extension to your closet! If you are looking for a place to store your television in your bedroom without the clutter, the Louis Philippe Armoire can be customized to add pocket doors, VCR shelves, knockout back panels and a TV swivel for the perfect solution. The Louis Philippe Armoire is completely handcrafted from solid hardwoods by old-world Amish craftsmen! Made in the USA! Please call us toll-free at 1-866-272-6773 to speak with an Amish Furniture Specialist. We will be happy to help you with any questions you may have or to take your order over the phone. Inside Door Opening Width: 32"
Inside Door Depth: 19 ½"